The US and Europe have lower than expected robot adoption rates given their relative wealth. South Korea, Germany, and the United States have some of the highest rates of adoption. But adjust for each countries’ wages, and the expected robot adoption rate given the countries’ relative wealth: many European and American countries have lower-than-expected adoption rates. When taking wages into account, Asian countries far outpace their western counterparts. If robots are the future of manufacturing, American and European countries have some catching up to do to stay competitive. 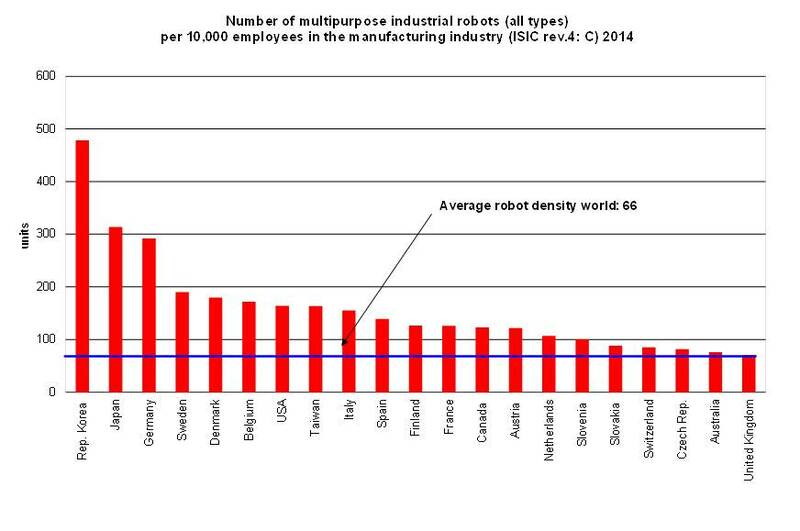 There’s perhaps no more telling metric for our time than the number of robots in a country per every 10,000 manufacturing workers. With the threat of automation looming, it’s commonly understood that manufacturing jobs will be some of the first to go. But researchers believe the metric may not be the best way to measure countries’ openness to a bot-filled future. As a new report from the Information, Technology, and Innovation Foundation notes, there is a naturally stronger economic case for adopting robots in higher-wage economies than in lower-wage economies, meaning the popularity of robots is skewed to favor countries that can afford to pay for them. This makes sense, given that industrial robots can cost well over $100,000 each. Compare these two charts. 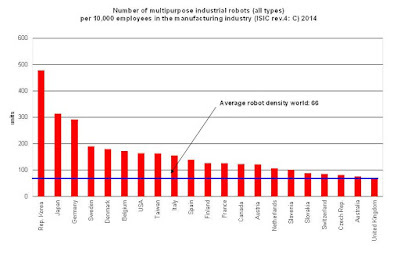 In the first, countries are listed in descending order based on the number of industrial robots in circulation in 2017. Not surprisingly, rich countries—like South Korea, Germany, and the United States—have some of the highest rates of adoption. But adjust for each countries’ wages, and the data tell a very different story. 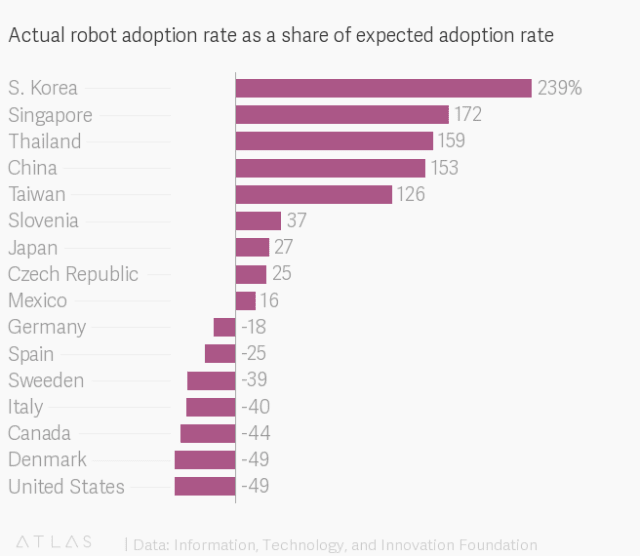 In the second chart, the researchers adjusted for the expected robot adoption rate given the countries’ relative wealth. You’ll see that many European and American countries have lower-than-expected adoption rates. The upshot of all of this is relatively straightforward. When taking wages into account, Asian countries far outpace their western counterparts. If robots are the future of manufacturing, American and European countries have some catching up to do to stay competitive.